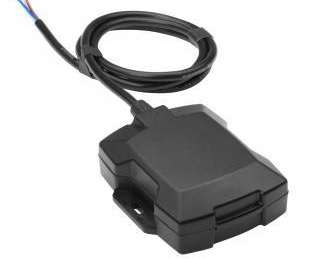 Vehicle Tracker - How do I install the device and start tracking? Now that you have created your account and activated your new vehicle device we would like to help you with the installation. Please follow the simple steps below to start locating. Provisioning after activation can take up to four hours to update with your first locate. All other locates will update every minute when the vehicle is moving. * Review the Vehicle Device Installation Warnings below Step 3. * Connect the RED wire (POWER) to a constant +12 volt DC or +24 volt DC battery power voltage. Connect POWER wire directly to your car battery or a fuse with constant power. A great location for installation that provides best access to the GPS satellites is inside the dashboard behind the glove box. * Connect the BLACK wire (GROUND) to the negative ground. * White wire installation is optional and reserved for FLEET accounts only. Connect the WHITE wire (ignition wire) to a fuse or wire that only has power when the ignition is on. This allows tracking of engine on and off in the daily activity report and idle time reporting. If you are interested in a fleet account for your business please Click Contact Support in our Knowledge Base. * Secure device with provided Velcro strip. * The recommended installation location is under the dashboard, but the device can also be connected directly to the vehicle’s battery. * To ensure successful installation, the green and amber LED lights will flash and then become solid as they connect both to GPS and the wireless network. 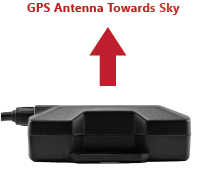 * We recommend that the GPS Antenna is pointing towards the sky if installed under the dashboard or toward the headlights if installed directly to the battery under the hood. The antenna is in the rounded top of the device. Additional wires available for Fleet service only. Please contact us if you would like to use our fleet services. White - Ignition/ engine on/off or PTO (power take off) on/off. Install this wire to something is is powered only when the ignition or PTO is on. Take your device for a ten minute drive to charge the device and to connect with satellites to start locating. Provisioning after activation can take up to four hours to update with your first locate. All other locates will update every minute when the vehicle is moving. 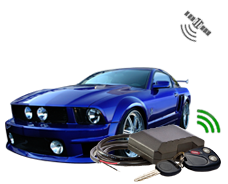 WE RECOMMEND THAT CUSTOMERS USE A PROFESSIONAL AUTOMOTIVE TECHNICIAN TO INSTALL THEIR DEVICES. WE RECOMMEND THAT CUSTOMERS INSTALL THEIR VEHICLE UNITS UNDER THE DASH CLOSE TO THE FRONT WINDSHIELD OR BACK OF THE CAR CLOSE TO REAR WINDOW TO ENSURE MAXIMUM SAFETY. Engine must be turned off and cool prior to installing the device. Do not place wires anywhere they may overheat. Do not place wires anywhere that may cause them to be cut. If the device is mounted on the inside of your engine compartment, make sure it does not overheat. If jump starting you battery we recommend disconnecting the device beforehand. The tracker is not successfully receiving full time power. Lights on your tracker should be visible within just a few seconds of the red wire being connected to power. If the lights are not on, then the device does not have power. Please check your connections and ensure that once installed, the device has been taken for a 10 minute drive to charge the internal battery. The tracker will have a quick flashing green light as it attempts to connect with the satellite network. Once it successfully connects, this light will turn solid. If the green light is flashing it means it does not have a satellite signal, so something is blocking or interfering with the satellite connection. Metal or cement are a common GPS signal blockers. The tracker will have a flashing amber light as it connects with the local GSM wireless network. Once it successfully connects, this light will turn solid. If the amber light is flashing it does not have a wireless signal or it has not yet been activated. The device uses 3G wireless assisted GPS technology. In order for the satellite information to reach our servers the device has to be in an area with 3G wireless coverage. If in a parking garage or an area with low cell coverage, this has the potential to block wireless and satellite connectivity. If the device is activated, the lights are on and solid or flashing and you have driven the vehicle, but the device is not locating, please reset the device by uninstalling it and letting the battery drain (the lights will turn off when fully drained) then reinstall the device. Then, take the device for a ten minute drive to start locating. Please contact us to let us know what wires you are using if your device is consistently showing locates in the same location even when the device is moving and in a different location. This could be due to what we call "pinning". This can be corrected by updating the configuration that is determined by the wires you are using. Each installation has its own configuration determined by the the wires being used. If the wrong configuration is set on your device, the location can "pin" at the location of the last good signal. Your device will not pin if you are using only the red and black wires. Please explore other articles in our informative knowledge base if you have any additional questions!